Testicular germ cell tumors (TGCTs) are one of the most common type of cancer in young men of European descent and are considered to be among the most curable. Researchers for The Cancer Genome Atlas (TCGA) Research Network now report on the results of a comprehensive genetic and epigenetic analysis of 137 TGCTs, which has identified molecular features of the different types of TGCT. They suggest the findings could help to stratify patients and so improve treatment decision making, aid patient monitoring, and offer up new potential therapeutic targets. There are about 9310 new cases of testicular cancer and 400 related deaths annually in the U.S. However, while the disease is rare and considered to be among the most curable of solid tumors—with 95% of patients surviving for five years—more research is needed to help stratify patients according to risk, and so help to avoid overtreatment and also monitor patients after treatment. “…survivors can experience devastating late effects of treatment, and a pressing research goal is the discovery of rational means of risk stratification that could spare some patients unnecessary chemotherapy, radiation, and surgery,” the authors write. There are two major histological types of TGCT, pure classic seminoma and nonseminomatous germ cell tumors (NSGCTs), the reserchers explain. NSGCTs comprise embryonal carcinoma (EC), choriocarcinoma, yolk sac tumor, and teratoma, which can contain a mix of both seminomatous and nonseminomatous components. The researchers characterized 137 TGCTs using multiple genetic and epigenetic analysis techniques, including using DNA exome sequencing, RNA and microRNA (miRNA) sequencing, DNA single-nucleotide polymorphism (SNP) arrays, DNA methylation arrays, and reverse-phase protein arrays. There were differing profiles of miRNA, mRNA, and protein between seminomas and NSGCTs, and a number of miRNAs identified could potentially be used to monitor patients for disease recurrence. The authors suggest that while serum tumor markers are currently used to stratify risk for testicular germ cell tumors, the new results have highlighted additional potential markers that could help to make stratification even more accurate. “We found microRNAS that could be used to detect the different types of testicular cancer, and this potentially could be developed into a minimally invasive serum blood test to determine if their cancer has come back,” Dr. Hoadley suggests. “We think that could be important for future screening.” EC tumors in particular displayed high expression of multiple miRNAs, the team notes. 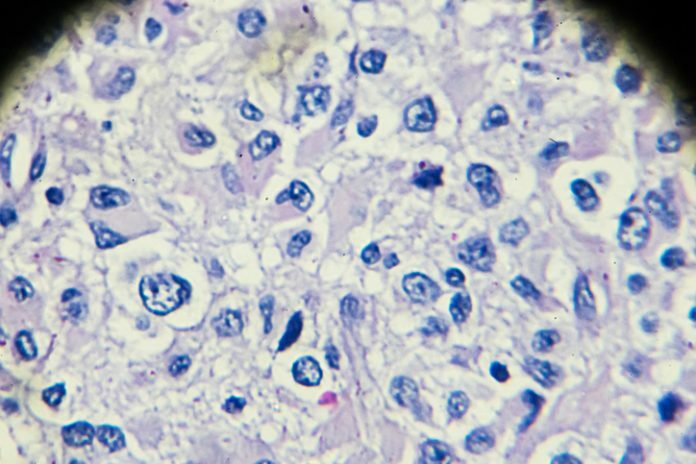 Overall, the KIT-mutated seminomas exhibited “unique characteristics,” which included the highest levels of lymphocyte infiltration, the absence of global DNA methylation, and reduced KRAS mutation frequency and copy number alterations. All of the subtypes of NSCTs shared genomic characteristics, including lower ploidy and higher purity than seminoma. “Recurrent somatic mutations were rarely present in NSGCTs, even though the overall mutation density was not dramatically different from seminomas,” the team writes.